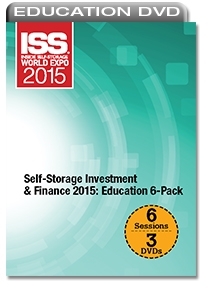 Get six education sessions that address important aspects of self-storage investment and finance. This discount bundle offers insight to buying property, capital markets, feasibility, finance options and more. A Proactive Approach to Self-Storage Financing- Get an overview of best practices and learn about market trends, loan factors, preparing a loan package, working with lenders and more. An Overview of the Self-Storage Investment Market- Understand the relationship between net operating income and self-storage property value, the transaction process, how to value underperforming properties, market opportunities and more. Buying and Selling Self-Storage: Tips for Investors and Owners- Learn how to identify self-storage properties that have upside potential for improved returns and avoid common pitfalls during the purchase process. Creative Investment Strategies for Self-Storage- Learn creative ways to break into the self-storage business that limit risk and don’t require a lot of capital. Get tips on preparation, types of acquisitions, how to maximize resources and more. Self-Storage and the Capital Markets: A Panel Discussion- Gain knowledge about the current debt market and lending products, including rates, terms and costs. Learn how to differentiate between options, pick the right debt offering for your situation, and more. What You Need to Know About Self-Storage Feasibility and Due Diligence- Learn about key market factors, costly mistakes to avoid and resources to help you make sound business decisions.